The Dornier Do 17, sometimes referred to as the Fliegender Bleistift (German: "flying pencil"), was a World War II German light bomber produced by Claudius Dornier's company, Dornier Flugzeugwerke. It was designed as a Schnellbomber ("fast bomber"), a light bomber which, in theory, would be so fast that it could outrun defending fighter aircraft. The Dornier was designed with two engines mounted on a "shoulder wing" structure and possessed a twin tail fin configuration. The type was popular among its crews due to its manoeuvrable handling at low altitude, which made the Dornier capable of surprise bombing attacks. Its sleek and thin airframe made it harder to hit than other German bombers, as it presented less of a target. Designed in the early 1930s, it was one of the three main Luftwaffe bomber types used in the first three years of the war. The Do 17 made its combat debut in 1937 during the Spanish Civil War, operating in the Condor Legion in various roles. Along with the Heinkel He 111 it was the main bomber type of the German air arm in 1939–1940. The Dornier was used throughout the war, and saw action in significant numbers in every major campaign theatre as a front line aircraft until the end of 1941, when its effectiveness and usage was curtailed as its bomb load and range were limited. Production of the Dornier ended in the summer of 1940, in favour of the newer and more powerful Junkers Ju 88. The successor of the Do 17 was the much more powerful Dornier Do 217, which started to appear in strength in 1942. Even so, the Do 17 continued service in the Luftwaffe in various roles until the end of the war, as a glider tug, research and trainer aircraft. A considerable number of surviving examples were sent to other Axis nations. Few Dornier Do 17s survived the war. The last was scrapped in Finland in 1952. On 3 September 2010, the Royal Air Force Museum London announced the discovery of a Dornier Do 17 buried in the Goodwin Sands off the coast of Kent, England. The aircraft is in good condition, and owing to its unique and rare stature, the Museum is making plans to protect the bomber and to raise it. Despite the success of the Do-17, owing to shortages in the supply of the Daimler-Benz engine, the production Do 17M was fitted with the Bramo 323 engine, with the corresponding reconnaissance aircraft, the Do 17P, being powered by BMW 132Ns to give better range. The supply of the DB 600 remained extremely limited as production was soon switched over to the fuel-injected DB 601, which was reserved for the Messerschmitt Bf 109 and Messerschmitt Bf 110 fighters. Therefore production versions of the basic Do 17M model airframe were fitted with the new Bramo 323A-1 Fafnir engines of 670 kW (900 hp), which gave reasonable performance and raised the bomb load to 1,000 kg (2,200 lb). The resulting Do 17M-1 was produced in small numbers and operated until 1941. The prototypes for the M-1 series were Do 17M V1 (Wrk Nr 691) and Do 17M V2 (Wrk Nr 692) which were tested with bomb loads of a medium bomber. The third prototype, Do 17M V3 was evaluated as a fast bomber. The MV1 was fitted with two Daimler Benz DB 601 inline engines while the MV2 and MV3 had the Bramo 323 A and D respectively. The Ministry of Aviation favoured the widespread use of the DB 601, but demand for the DB 601s in fighter aircraft and the lack of production forced the use of the Bramo. The Do 17M-1 started its service as a medium bomber and was able to carry 2,200 lb (1,000 kg) of bombs. It was equipped with two air-cooled Bramo 323 A-1 or A-2. The defensive armament consisted of two, and later three, MG 15 machine guns. The first was operated in an A-Stand pod operated by the navigator through the windshield. The position was allocated 370 rounds of ammunition. The rearward firing B-Stand was operated by the radio operator and allocated 750 rounds. The rear position in the lower fuselage was allocated 375 rounds in a C-Stand pod. The Do 17M could carry a bomb load of either 20 SC50 50 kg (110 lb) or two SC250 500 kg (1,100 lb) bombs or 10 SC50 and a single SC250 bomb. The speed of the M was superior to that of the E variant. The Do 17M could reach 420 km/h (250 mph) at altitudes of 3,500 m (11,500 ft) and could achieve a maximum service ceiling of 5,790 m (19,000 ft) and a range of 850 nautical miles (1,570 km). Typical of RS kits, the exterior detailing is very well done with finely engraved panel lines. The tan sprues did not have any flash or sink areas that I could see. They did, however, have ejector towers on the inside of any part of relatively large size like the wings, engine nacelles and the such. The kit relies on photo etch and resin parts to provide the very small parts. The photo etch fret is in color by Eduard and includes the main instrument panel and instruments, seat harnesses, rudder pedals, elevator hinges, engine pushrods, cowling braces and some very thin additions to the landing gear. Resin is used for the cockpit seats, engine intakes, and machine gun bits. Engine cowlings are split vertically so there will be a lip seam to try to blend in. There are a few interior instrument panels and a bulkhead. The cockpit as such is simply the floor, seats for the pilot, navigator and gunner along with a control column and rudder pedals. Wheel wells are devoid of any detail, though there is detail on the gear door insides. Clear parts are well done though a bit on the thick side. 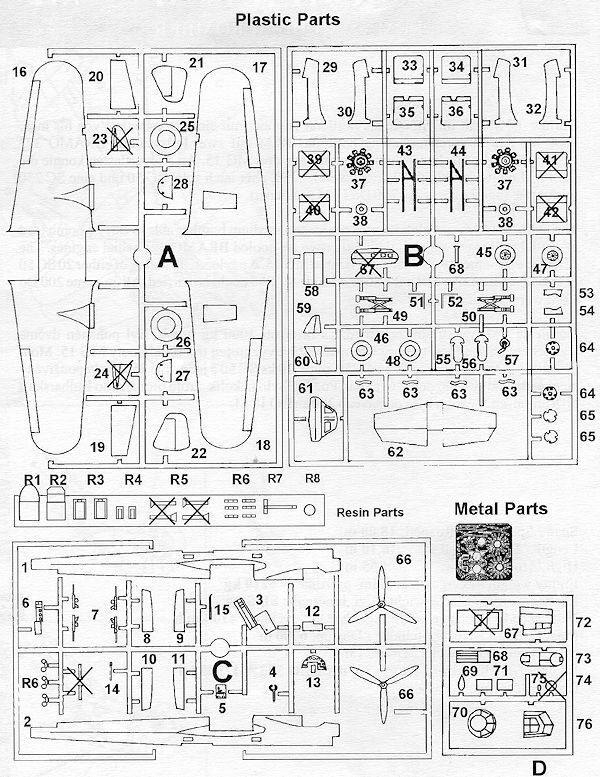 As you can see from the parts diagram, therea re bits that are not used for this variant. Instructions are a single sheet of folded paper with only half of that space used for the 11 construction steps. It is really quite a small area to cram all that information so one will need to be careful not to miss anything. No interior or wheel well color information is supplied, though I would suspect both to be RLM 02. Exterior painting information is provided with RLM and generic numbers. Two aircraft, both in RLM 70/71/65 are on the painting guide. One is the box art plane with yellow engine cowlings from an unknown training squadron. One would have though that a bit of research would have provided an operational bomber. The other is for a Bulgarian AF version with white wing tips top and bottom as well as a white fuselage band from 1944. The decals look to be well printed. I am not sure if anyone does aftermarket markings for this plane. Truth be told, were this kit not on sale I would never have bought it. 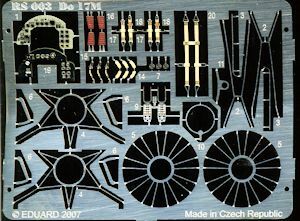 I am sure by just looking at it that it is worlds ahead of the Airfix Do-17, but that is sort of apples and oranges as this is the radial engine version and the Airfix kit is not. The detail is there and I am sure that with a bit of care, it will build into an excellent model. 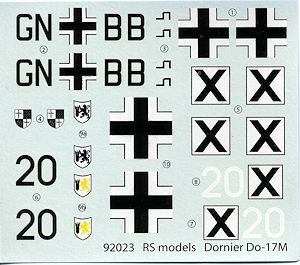 As a note, back in 2006, before this kit was issued, Carmel Attard kitbased the Do-17P, which was the recce version of the M. Here is his article.